In The Four Agreements, don Miguel Ruiz revealed how the process of our education, or “domestication,” can make us forget the wisdom we were born with. Throughout our lives, we make many agreements that go against ourselves and create needless suffering. The Four Agreements help us to break these self-limiting agreements and replace them with agreements that bring us personal freedom, happiness, and love. Now don Miguel Ruiz joins his son don Jose Ruiz to offer a fresh perspective on The Four Agreements, and a powerful new agreement for transforming our lives into our personal heaven: the fifth agreement. 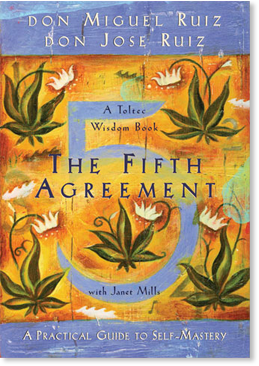 The Fifth Agreement takes us to a deeper level of awareness of the power of the Self, and returns us to the authenticity we were born with. In this compelling sequel to the book that has changed the lives of millions of people around the world, we are reminded of the greatest gift we can give ourselves: the freedom to be who we really are. For thousands of years humans have tried to understand the universe, nature, and mainly human nature. It’s amazing to observe humans in action all around the world, in all the different places and cultures that exist on this beautiful planet Earth. Humans make a lot of effort to understand, but in doing so we also make a lot of assumptions. We distort the truth and create the most amazing theories; we create entire philosophies and the most amazing religions; we create stories and superstitions about everything, including ourselves. And this is exactly the main point: We create them. Humans are born with the power of creation, and we are constantly creating stories with the words that we learned. Every one of us uses the word to form our opinions, to express our point of view. Countless events are happening all around us, and using our attention, we have the capacity to put all these events together in a story. We create the story of our own life, the story of our family, the story of our community, the story of our country, the story of humanity, the story of the entire world. Every one of us has a story that we share, a message that we deliver to ourselves, and to everyone and everything around us. You were programmed to deliver a message, and the creation of that message is your greatest art. What is the message? Your life. With that message, you create mainly the story of you, and then a story about everything you perceive. You create an entire virtual reality in your mind, and you live in that reality. When you think, you’re thinking in your language; you’re repeating in your mind all those words that mean something to you. You’re giving yourself a message, and that message is the truth for you because you believe that it’s the truth. The story of you is everything that you know about you. And when I say this, I’m talking to you, knowledge, what you believe you are, not to you, the human, what you really are. As you can see, I make a distinction between you and you because one of you is real, and one of you is not real. You, the physical human, are real; you are the truth. You, knowledge — you’re not real; you’re virtual. You only exist because of the agreements you made with yourself and with the other humans around you. You, knowledge, come from the words you hear in your head, from all the opinions of the people you love, the people you don’t love, the people you know, and mostly the people you’ll never know. Who is talking in your head? You make the assumption that it’s you. But if you are the one who is talking, then who is listening? You, knowledge, are the one who is talking in your head, telling you what you are. You, the human, are listening, but you, the human, existed long before you had knowledge. You existed long before you understood all those words, before you learned to speak, and just like any child before he or she learns to speak, you were completely authentic. You didn’t pretend to be what you are not. Without even knowing it, you trusted yourself completely; you loved yourself completely. Before you learned knowledge, you were totally free to be what you really are because all those opinions and stories from other humans were not in your head already. Your mind is full of knowledge, but how are you using that knowledge? How are you using the word when it comes to describing yourself? When you look at yourself in a mirror, do you like what you see, or do you judge your body and use all those words to tell yourself lies? Is it really true that you are too short or too tall, too heavy or too thin? Is it really true that you are not beautiful? Is it really true that you’re not perfect just the way you are? Can you see all the judgments that you have about yourself? Every judgment is just an opinion — it’s just a point of view — and that point of view wasn’t there when you were born. Everything you think about yourself, everything you believe about yourself, is because you learned it. You learned the opinions from Mom, Dad, siblings, and society. They sent all those images of how a body should look; they expressed all those opinions about the way you are, the way you are not, the way you should be. They delivered a message, and you agreed with that message. And now you think so many things about what you are, but are they the truth? You see, the problem is not really knowledge; the problem is believing in a distortion of knowledge — and that is what we call a lie. What is the truth, and what is the lie? What is real, and what is virtual? Can you see the difference, or do you believe that voice in your head every time it speaks and distorts the truth while assuring you that what you believe is the way things really are? Is it really true that you’re not a good human, and that you’ll never be good enough? Is it really true that you don’t deserve to be happy? Is it really true that you’re not worthy of love? If you use your awareness, you will see everything you believe, and this is how you live your life. Your life is totally dominated by the system of beliefs that you learned. Whatever you believe is creating the story that you’re experiencing; whatever you believe is creating the emotions that you’re experiencing. And you may really want to believe that you are what you believe, but that image is completely false. It’s not the real you. The real you is unique and it’s beyond everything that you know, because the real you is the truth. You, the human, are the truth. Your physical presence is real. What you believe about yourself is not real, and it’s not important unless you want to create a better story for yourself. Truth or fiction; either way, the story that you’re creating is a work of art. Words are your paintbrush, and your life is the canvas. You can paint whatever you want to paint; you can even copy another artist’s work — but what you express with your paintbrush is the way you see yourself, the way you see the entire reality. What you paint is your life, and how it looks will depend on how you are using the word. When you realize this, it may dawn on you that the word is a powerful tool for creation. When you learn to use that tool with awareness, you can make history with the word. What history? Your life’s history, of course. The story of you. 13. The Three Languages — What Kind of Messenger Are You?